Nintendo World is dead. Long live Nintendo NY. 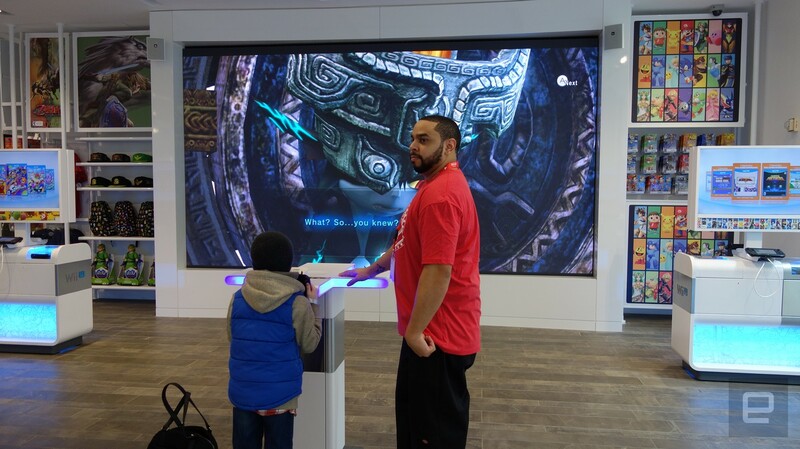 In the decade since Nintendo World opened, the store has become a tourist destination, a popular hangout for kids and a mecca for Nintendo fans across the globe. With that last audience in mind, it shut its doors last month so it could be remodeled into something more befitting its status as the world's only Nintendo retail location. And with that new design comes a new name: Nintendo NY. As the company tells it, this isn't just a Nintendo-branded shop or a place to buy Nintendo swag. It is Nintendo. Regional General Manager PJ Sadler told Engadget that the company's racetrack logo represents a high level of quality, an ideal that's meant to be represented in every aspect of the store. In practice, that means a new layout, new lighting and new exhibits. Nintendo made a lot of the design decisions, but it also consulted with Gensler, a New York-based architectural firm. Some of the changes are immediately obvious: The first-floor registers have been relocated to the west wall of the store, and the upstairs alcove has been completely torn out. 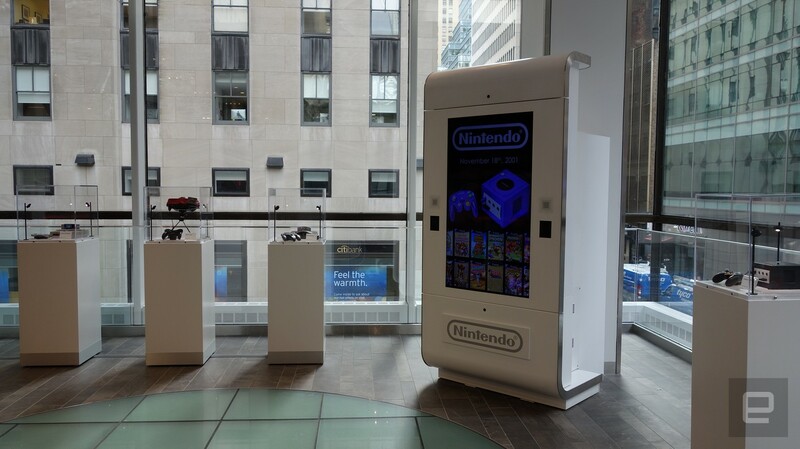 This helped to open up the space, as well as make Nintendo NY adaptable. In particular, all of the display cases have been put on wheels so that they can be easily moved around, either for a fresh look or to make room for events. The Pokkén Tournament regional finals next month will be the first major test of this modular design. Anyone who's ever marveled at the gaming museum on the second floor will be happy to know that the historical displays will continue, with items swapped out every few months depending on what games the company is promoting. The current exhibit contains a gallery of Nintendo consoles over the years, including a yellowing SNES and the much-maligned Virtual Boy. While some items are taken straight from the Nintendo archives, Sadler told us that most of the exhibits are collected with help from store employees. Other history on display includes a case of handheld systems ranging all the way from the LCD Game & Watch units to the current 3DS XL. And yes, the infamous "Gulf War Game Boy" is there, and it still works. One of the nice things about this area of the store is that all of the objects are in clear glass cases, allowing natural light to filter in from 48th Street. It's a much less claustrophobic space now. Nintendo NY also kept a few nods to the store's history as well. The front doors are the same from when it was Pokémon Center NY, with circular Poké Ball handles. Above the elevator the metal silhouettes of Mario characters remain as a homage to the shop's Nintendo World days. Mario's presence is still a big part of Nintendo NY, too. There are new statues of him and Luigi adorning the staircase. This morning's ceremony also featured costumed character versions of the Mario Bros., as well as a more human element: Mario's voice actor, Charles Martinet. 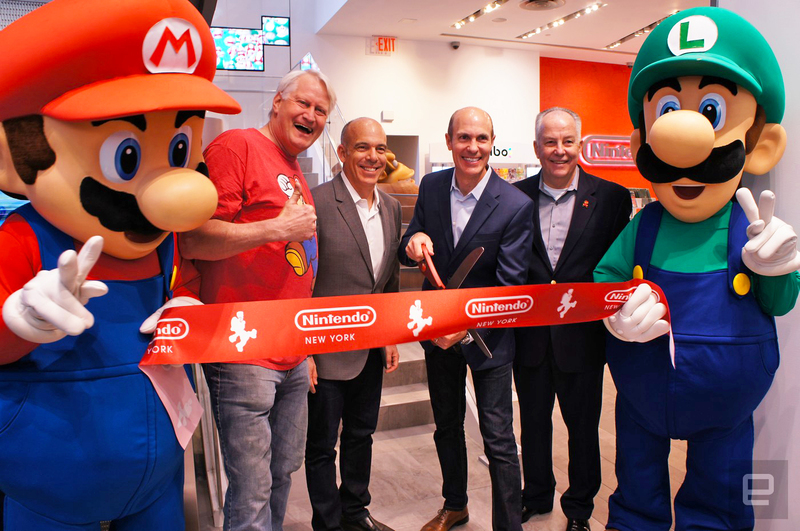 He hammed it up with the crowd and joined in on a ribbon-cutting ceremony that also included Nintendo sales EVP Scott Moffitt and sales VP Doug Bowser. Of course, this little bit of decor was only for the press: The store itself didn't open to the public for another three hours. When I got there at 8:30 am Friday morning, the line stretched from the front door at Rockefeller Plaza all the way down to Sixth Avenue. The first person in line arrived at 6 am ... the morning before. There were people wrapped in blankets and sitting in fold-out chairs. One guy was passed out on the ground. Many brought their 3DS handhelds to pass the time and capture some sweet StreetPass action. Though some people were there for the release of Fire Emblem Fates, most were there out of a sheer love for Nintendo. 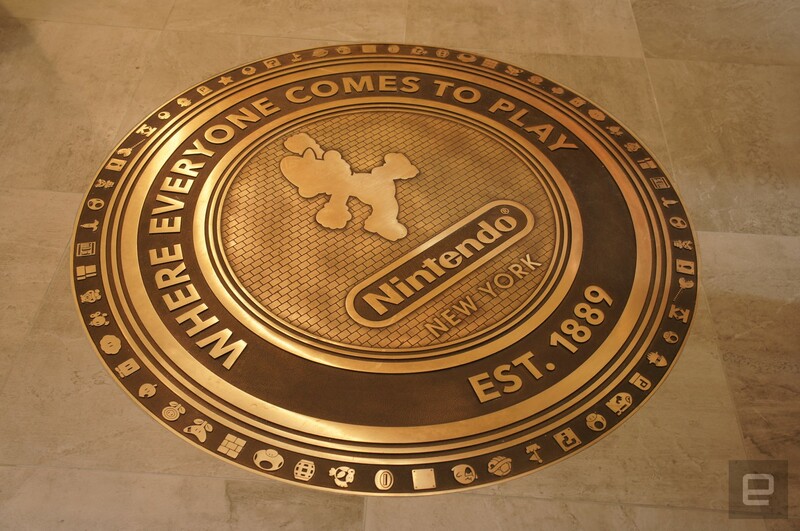 Hopefully, the new Nintendo NY can be their shrine.